Pour 2 packs of yeast into a small bowl and add 2 Tablespoons of sugar. Next, pour ½ cup WARM water over the yeast and stir. Now set the yeast aside for 5-10 minutes to allow it to grow. It will probably double in size. While your yeast is rising, pour 1 can of carnation milk and 1 ½ cups of skim milk into a large bowl. Next, beat 3 eggs in a bowl. Then add them to the milk mixture. Add 1 cup of sugar and 1 Tablespoon of salt to the milk and eggs. Add ½ cup MELTED margarine to your mixture. Begin adding flour 1 cup at a time, stirring after each addition. After you have added 2-3 cups of flour, add your yeast to the bread mixture and stir thoroughly. Finally, continue adding flour 1 cup at a time. You will add a total of 10 cups of flour. After you have added all 10 cups of flour, turn your dough onto a floured cutting board to knead it. You will be adding additional flour as you knead the bread. That’s okay. Knead the bread for 5-10 minutes or until it forms a ball. After you have kneaded your bread and it has formed a ball, place your ball of dough in a large GREASED bowl. The dough needs to grow. Let it rise until it doubles. This could take 2-3 hours. During this time, you don’t have to do anything to it. Just make sure it is covered with a paper towel or dish cloth. After the dough has doubled, punch it down. This part is fun! When you punch the dough, all of the air should compress and the dough will fall. After you’ve punched the bread, cover again with a paper towel and allow it to rise again until it is doubled. 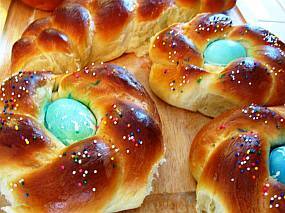 After the dough has doubled for the second time, you are ready to make Easter bread or whatever else you want. Start by GREASING a bread pan. DO NOT FLOUR THE PAN. You can use a bread pan for this, or you can use any dish that can go into the oven. When I make this bread, I use a bread pan. Next, pull off a hunk of dough that is equal to half of the pan you will use to bake your bread. Form the dough into a nice shape with your hands, then place the dough into your bread pan. The next step is brushing the bread with an egg wash. Egg wash is simply 1 egg and 1 Tablespoon of skim milk whipped together. To apply, simply brush the egg wash over the top of your bread. This will keep the crust soft and shiny. Cover your bread pan with a paper towel and set your bread aside to rise until the dough has doubled. After the dough has doubled and filled the bread pan, bake your bread at 375 degrees for 20 to 30 minutes for a small loaf or 40-50 minutes for a large loaf. To know if your bread is finished baking, stick a knife into the bread and pull it back out. If the knife comes out clean, your bread is done. If it doesn’t come out clean, your bread needs to bake a little longer.